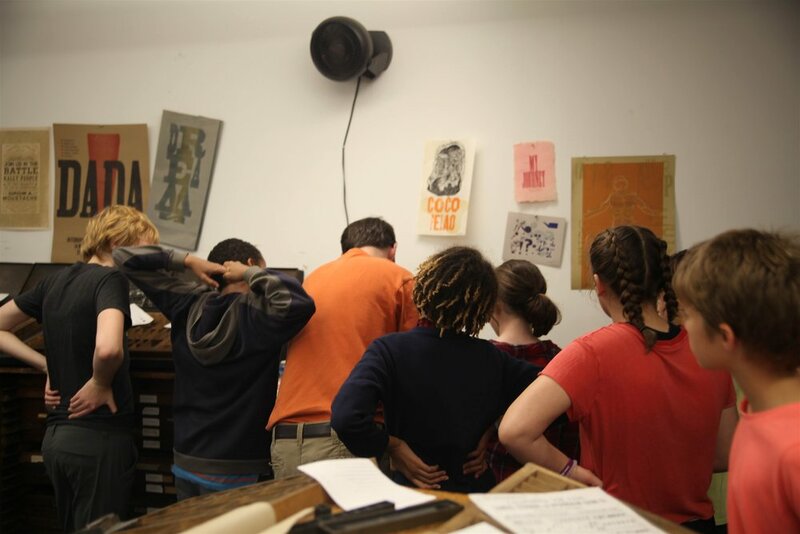 On October 19, Division I traveled to Union Press in Somerville to learn about letterpress printing. The theme of our Humanities class this year is Media & Journalism, and we’ve been exploring those topics from many angles. Throughout the first trimester, we’ve been studying labor in the 1840s, and we’ve looked at how mill girls in Lowell used the media to support their fight for better labor conditions. Letterpresses were a primary tool for mass media in the 1840s, so this felt like a perfect place to go at the end of our unit. Our main project at the studio at the studio was to make posters for our class debate about the Lowell Mills, which centered on the question: Were the mills ultimately an opportunity or a dead end for the girls who worked there? We were split into teams to gather evidence for one side or the other. When we first entered the small room, Union Press owner Eli Epstein greeted us. We immediately saw the text our teams had created and the linoleum cuts made from the illustrations that each team’s designer had drawn. We then got a run-down of what we were going to do and jumped into it. We began arranging wood and metal letters, slightly confused by having to position them backwards so the final print would come out forwards. We added spaces and put them into special holders. When we were done, we transferred everything to the printing press and printed the two different posters. Both had errors, which Eli said was just part of the letterpress process – one of us had put an “n” where there was meant to be a “u” – and we each got a print of our team’s poster. In the end, we returned feeling satisfied to have real letterpress prints that we’d designed ourselves. By 6th grader Ezra K.
In late September, during their field trips to Sturbridge Village and the Lowell Mills, Division I Humanities students asked questions and learned about labor in the 1840’s. To start off our unit, we read a historical fiction book called Lyddie, by Katherine Paterson. The story follows a young woman on her journey from the Vermont farm where she grew up to the Lowell Mills where she finds both challenges and opportunities. After we finished the book, we each choose a character we’d like to “interview” about their lives. We were divided into pairs and developed a series of questions for our characters, all the while anticipating our visits to Sturbridge Village and Lowell. 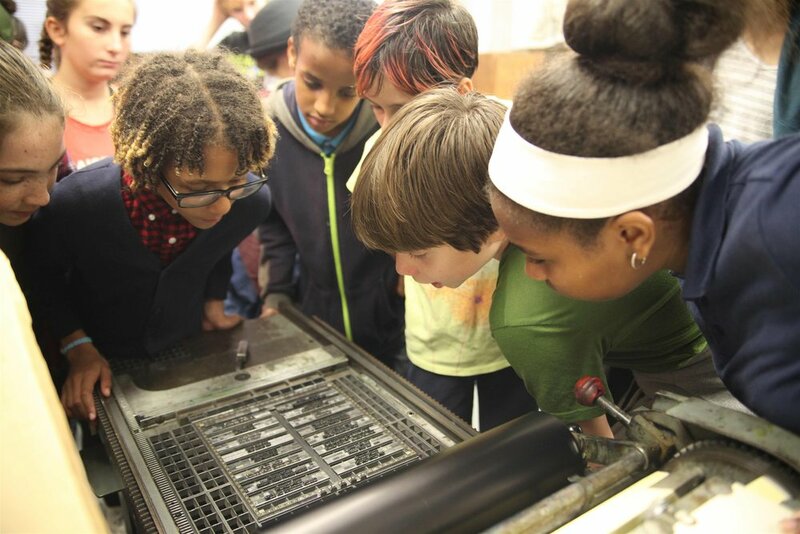 Our visit to Sturbridge Village began with a hands-on workshop on printmaking. Where we learned how to write with a quill and ink, and had the opportunity to create marbled paper. 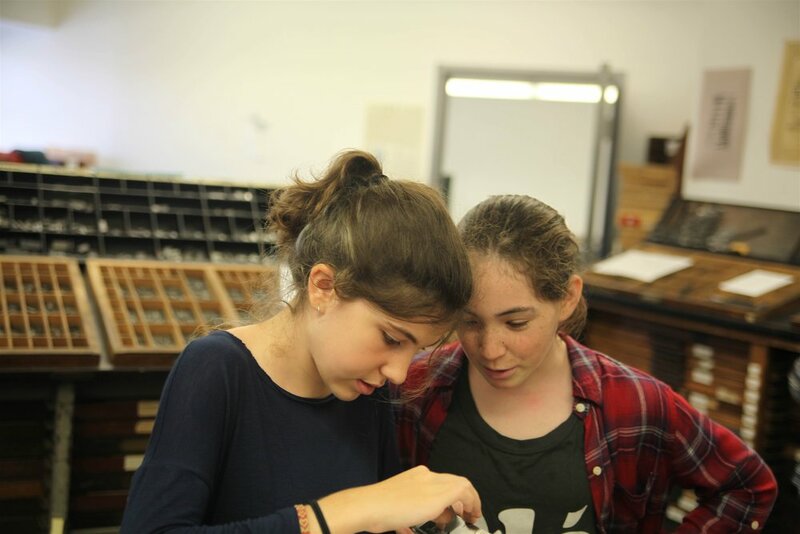 In addition, we each printed a picture at the printing press. After this, we started to explore Sturbridge Village. The students split into two groups depending on what kinds of information they hoped to find. My group was creating an interview with Diana Goss, a fictional worker activist in the mills. In our conversations with people at Sturbridge Village, we learned about why girls would leave the farms to work in the mills and their limited rights during this time period. It was instructive to roam from building to building, meeting the actors representing different people from the time period. Some of the more memorable buildings were the tavern, the law office, the print shop, the tin shop, the Quaker Meeting House, and the farm. I really enjoyed visiting Sturbridge Village and learning so much about the 1800’s in a fun and interactive way! The following week, we visited the Lowell Mills to continue learning about labor in this time period. First, our guide brought us to an interactive mill room, where we experienced a range of jobs, along with worker responsibilities and mill conditions. We discussed the consequences of pay cuts and lack of representation, and finally the workers organized a strike. Next, we learned about child labor all around the world. It was shocking and disappointing to learn that child labor persists today. Next, we went to the weaving room where we heard and saw real powered looms in action. Then, we visited a boarding house where mill girls would have stayed at, and we answered a few more question there. Finally, we went downstairs in the boarding house and met two awesome park rangers who gave us time to ask any remaining questions. I had a fascinating time at Lowell, I learned many things about child labor, mill life, and strikes. Overall, these two field trips where a productive start to our year and helped us learn how to report on people, ask good questions, and find out about daily life in the 1840’s. These intriguing field trips to Sturbridge Village and Lowell National Park have left their mark. History can be transmitted in many ways, and these field trips were exceptional experiences! The students of Division 4 were shocked earlier this month when they sat down at the Peabody Essex Museum in Salem to watch a video of what seemed to be a lovely wedding: a joining together of two wonderful families, a time of joy and laughter. The video quickly turned into something very unfamiliar. This present-day Chinese wedding, a decision made solely by the groom’s father, was a day mourning for the bride’s family; full of sadness and loss. The wedding video was certainly not the only powerful, thought-provoking exhibit we had the privilege of seeing. Earlier in the day, students spent some time in a typical, 1840’s American house, commenting on the architectural elements that made it stand out as one of wealth. Students were then immersed in Chinese home life, an experience that fell just short of actually visiting the country, by touring the Yin Yu Tang house brought over and reconstructed at the museum. There were many obvious differences between the two houses; the lack of flashy wallpaper and decorations in the Chinese house stood out. The students debriefed their visit the next day, talking about the differences and similarities between the two houses and what each conveyed about that culture. What did the small rooms and large common areas of the Yin Yu Tang house tell us about Chinese values as compared with the larger individual rooms in the colonial home? 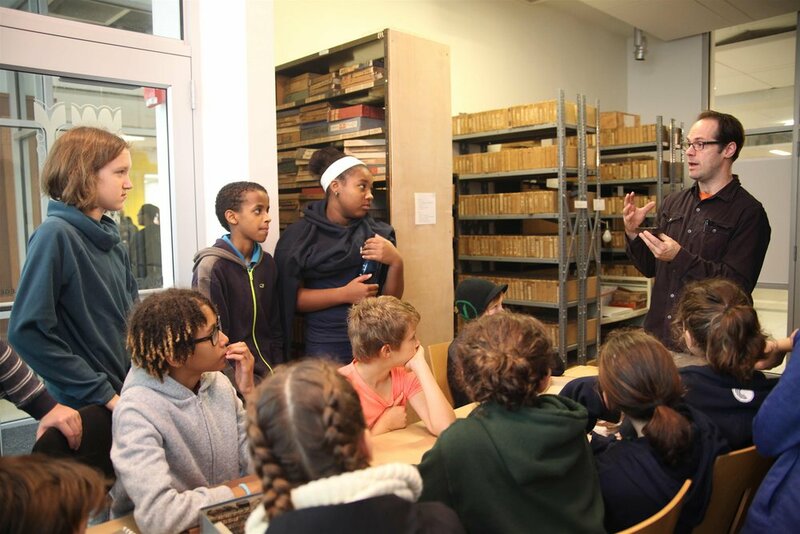 After spending an entire trimester learning about differences in worldview between the East and the West, Confuician filial piety, and major historical events in China, the museum visit served as a way to experience these topics in a more hands-on way. After a morning full of discussion on architecture and culture, students visited additional Chinese art exhibits, full of incredibly detailed pieces. These pieces ranged from a fragile, ornately detailed, carved ivory fan, to paintings done by Chinese artists imitating early 19th century American painting styles, to vibrantly colorful and, again, incredibly detailed porcelain vases. Afterwards, the day took a slight detour and Jon, Division 4’s calculus and physics teacher, got to feel right at home in an interactive exhibit on dimensions. Aside from a slight headache, the exhibit gave students a very fun, interactive introduction to the daunting world of physics. 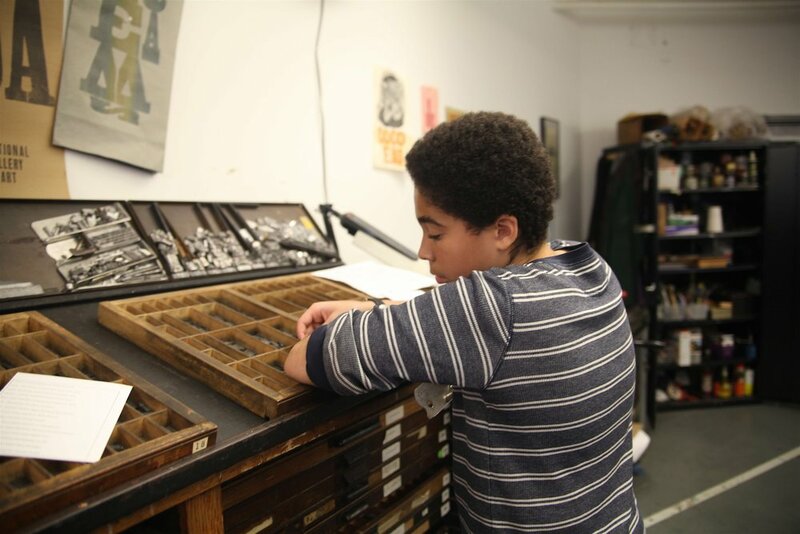 Division 4 Explores the Vietnam War's Legacy at "Memorial"
This past Friday, on October 21, the Division One Humanities students went to a letterpress workshop at the Massachusetts College of Art and Design. This year in humanities, we’re learning about media and journalism. For one of our projects, every student picked a muckraker they would like to learn more about. A muckraker is a reporter who uncovers and reports on issues that most people don’t know about. Before we went to the workshop, we created a six-word headline from the perspective of our muckraker. It could contain either a topic they cared about, something they found, out an issue they believed in. 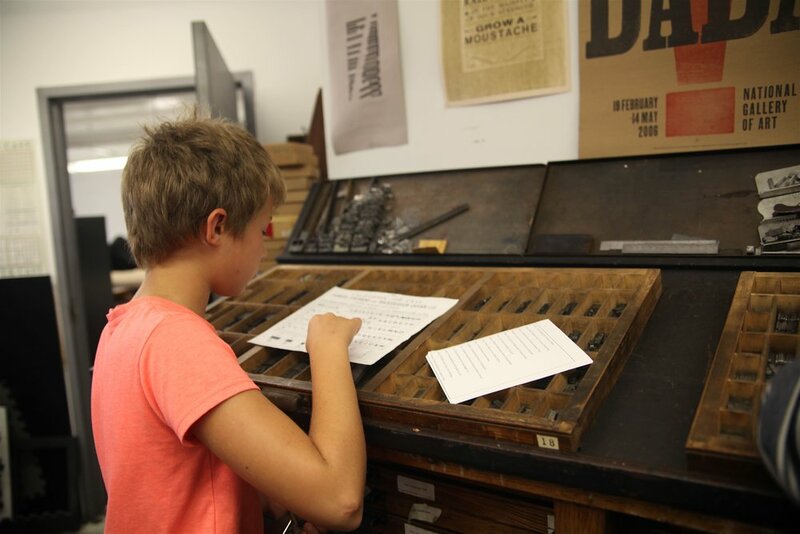 At the workshop, we would print these headlines on a real letterpress. We all took the train to Roxbury Crossing and then walked to MassArt from there. Our teacher Catherine and Kenny (a Meridian senior) were chaperones. We walked inside, and there was a small, almost claustrophobic room that contained high shelves with boxes that had different fonts and cuts for printing. Keith, our workshop leader, came to greet us. He talked about the origins of the printing press, showed us different things that people would print, and explained the different materials—some types were made of metal, others were made of wood. 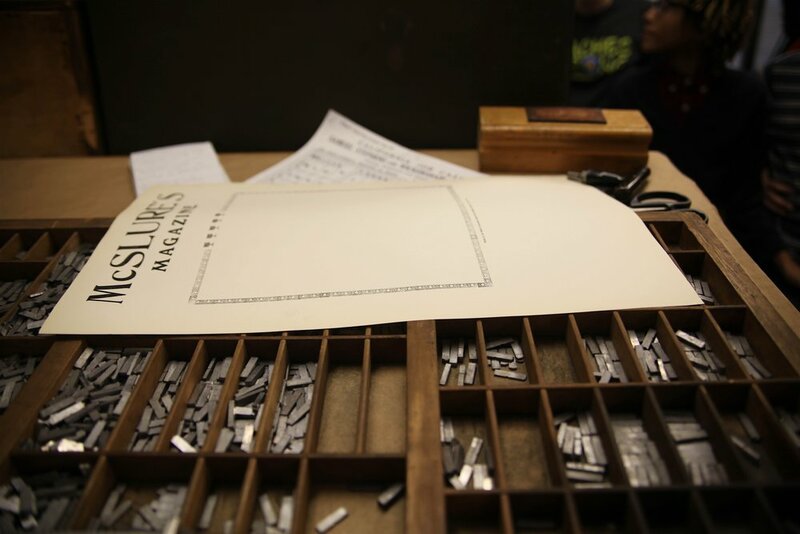 With new knowledge in our brains, we took the elevator up to floor nine to work with the actual letterpress. Keith entered a code onto the keypad and we entered the room. Much bigger! We put our bags down and immediately started touching things, but Keith wanted to set some ground rules, including no horse playing to protect the equipment. Each of us stood by these rectangular things that came up about four feet off the ground. It was time to “set our type,” which meant laying out each letter, space, or punctuation exactly how it should go to be printed. The rectangular cases had little boxes in them and each box had a different letter or piece of punctuation. There was a piece of paper that said where every letter was because it would be impossible to look through every letter until you found the one you wanted. Next, we got instructions about how we to hold the “job stick” that we would put our letters in. We also learned small but important details like why a “spaces” are shorter—they need to be shorter so they will not print. 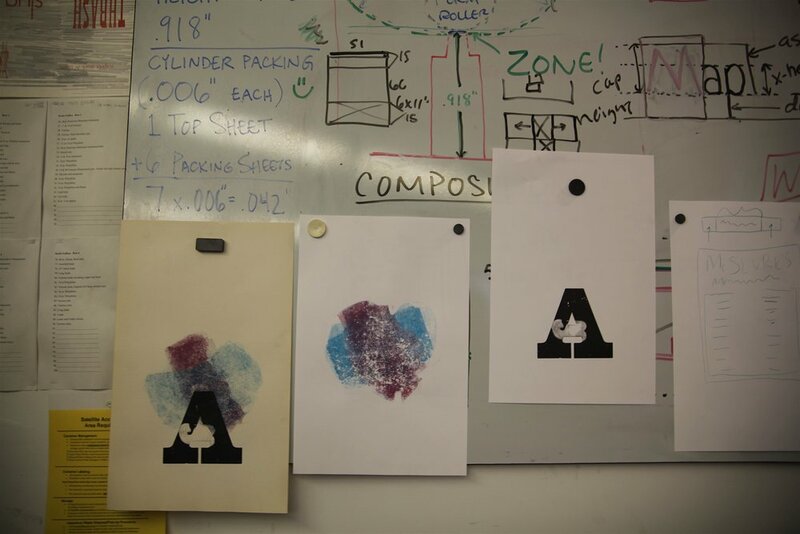 The process of setting type was long. It took most of us around forty-five minutes just to set six words! After lots of frustration of people's letters falling over, everyone was finally done. We watched Keith put the six-word headers into the bed of the press. We rolled the ink onto our letters and had a look to make sure they were all covered in ink. We “pulled a proof” and it looked pretty good, but Keith needed us to fix a few errors, like fonts that had broken type or incorrect spelling. Eventually we were all done setting it up again, so we went in and we each got to turn the handle of the press. When the finished product came out it was beautiful! It might have been a long process, but it was definitely worth the time. A guest post by 8th grader Marty. On Tuesday, November 24, I, along with the rest of Division 2, embarked on a field trip to Boston's South Station. The objective of the trip was to collect information for an essay that we are writing in our Humanities class, where we're learning about the Constitution and trying to interpret its text. After reading the Constitution, we each chose a specific part of the document that we wanted to amend. I chose the second section in the first article of the Constitution, which outlines the requirements to become a State Representative. Currently, the minimum age to become a State Representative is 25. To become a Senator, however, one must be 35. I thought this was unfair, and that the age should be the same for both Senators and State Reps. Age shouldn't dictate responsibility! While we were at South Station, we interviewed station patrons about their opinions regarding our proposed amendments and changes. We talked to a variety of people, all of whom had different opinions on our proposed amendments. Although we were occasionally frustrated -- not everyone wanted to talk to us in the middle of their work day -- in the end, most of us talked to six or seven different people. I was lucky enough to talk to eight. Because I wanted to examine different age requirements in government, one of the questions I asked was, "Do you trust 35 year olds more than 25 year olds?" All of the patrons I talked to unanimously agreed on their answer, and thought that age didn't truly dictate a person's responsibility level. It was fascinating to talk to different people and learn their thoughts and views. I gained many insights on how people understand and value the Constitution -- or not! This fall, Division 2 Humanities students have been looking at Colonial America and asking what gave rise to the Revolution. In search of answers beyond the traditional narrative of discontent with Britain, students studied life not only for the privileged colonists, but also for African-Americans, women, immigrants, indentured servants, and Native Americans. We asked: "What was changing socially that caused so much strife as to spur a change in governance?" As a part of this inquiry, students travelled to the John Adams National Park. There, students saw all three Adams family properties and paid close attention to how day-to-day life was lived. In her written reflection, Ally recorded how the challenges of colonial life spurred inventions like the curfew, “a metal cover of sorts that you put over the hot coals at night so that they are usable once again in the morning.” In our age of rapid-fire texts and updates, students particularly noticed the length to which colonists had to go to communicate. As Aneli wrote, people in the 1700s had to operate as "walking telephones" -- no small feat when you're trying to start an intercontinental revolution. With that quote as our inspiration, students made the short journey to Franklin Park where they each chose a tree that spoke to them in some way; maybe it had a funky branch coming off of one side, maybe it grew in the shade of larger trees, or maybe it stood alone, away from others. Students will be writing about their trees all year long, documenting the changes they notice as the seasons change. The time in which the students write also gives them an opportunity to only focus on one moment in time. Junior and senior year is often filled with major projects, college applications, and stress. Our tree journals offer students a chance to leave all this behind for a while and focus on something bigger than themselves, something that is right in front of them. To that end, it is our hope that students come away happy, appreciating the world around them. Sabina, a senior, said of her experience, “I love having a time when I can sit and observe nature. My tree has become much more of a being now. I really understand the power of Taoism when I sit and write about my tree.” Kenny, a junior, commented that, “It is interesting to look at something so intensely that is already there. I see those trees all the time, but now I see them in a different way.” At the end of the year, the student’s journals and experiences will be used in a collective artistic project that will represent the unique journey each of the students has taken with their tree.